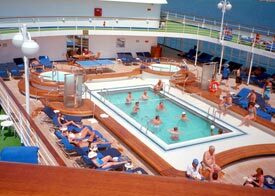 ABOVE: Passengers play water volleyball in the Silver Whisper swimming pool. 8:30 - Legs, Tums & Bums with Joe, our Fitness Instructor. 9:00 - The Golf Net is open between 9:00 a.m. and 5:00 p.m.
10:00 - Coffee Chat, meet the Social Team. 3:00 - Water volleyball with Ray. 4:00 - Afternoon tea is served with Ray at the Grand Piano. 4:00. - Needlepoint get together, join your hostess. 4:45 - Team Trivia: Test your general knowledge with Ray and Sonia. 5:15 - Greek Dance Class. Learn Zorba the Greek for tonight's BBQ. Other activities might include lectures by guest experts, impromptu wine tastings, culinary demonstrations, putting clinics and videotaped private lessons by the resident golf pro, visits to the navigational bridge, and bridge lessons (non-navigational variety) in the Card Room. Entertainment. The Silver Whisper isn't your best choice of ship for nonstop disco action and large-scale production numbers, but it offers a good variety of entertainment for a ship of its size. On a typical day, you can hear piano music in the Panorama Lounge at teatime, before dinner, and later in the evening until midnight. The Silver Whisper Quintet offers pre-dinner dance music in the Bar, where a disco DJ takes over at 11 p.m. The Viennese Lounge, a showroom with tiered seating and a large proscenium stage, offers 45-minute shows by the Jean Ryan Production Company several times during each cruise. On our cruise, we were lucky to have two fine vocalists: Catherine Lavalle, a classically trained singer who has performed on Broadway and in The Sound of Music's national tour, and Jim Weaver, a dapper singer-actor-choreographer whose credits include Marie Christine on Broadway and the European touring company of Bubbling Brown Sugar. On nights when a production show isn't taking place, the Viennese Lounge usually offers entertainment by guest vocalists, pianists, magicians, etc. And the puppet show by Cruise Director Ray Solaire (who has performed in the London Palladium) is an experience that shouldn't be missed. Solaire, who began his career at workingmen's clubs in Northern England, is a consummate showman: He sings, he does ventriloquism, he pulls off an occasional illusion, he recites outrageous puns, and he's a puppet master par excellence.